Seriously what’s with the look on that passenger’s face! Previous post: Five things a flight attendant DOESN’T want to hear! This is just TOO good not to share. 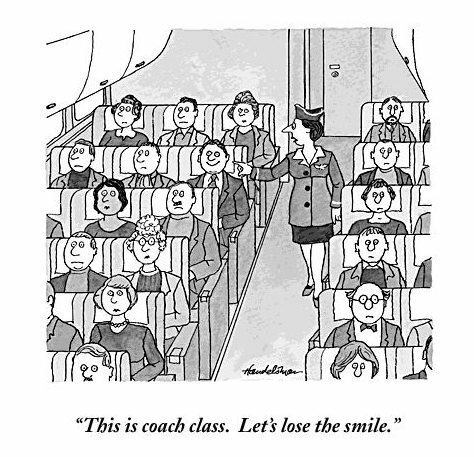 Based on the cartoon it appears that not a lot has changed – in coach class – over the last fourteen years. Keep in mind this was published BEFORE 9/11, back when we were still serving three meal choices in coach, handing out magazines, and even snacks before landing. In other words back when flying was still considered to be somewhat enjoyable. Weird, I know. I’d like to thank one of my favorite travelers, Savvy Navigator, for sharing it with me so I can in turn share it with you! This week’s Journeys Issue takes you to Croatia, Bermuda, and Russia – among other places. Below, a J.B. Handelsman cartoon from 1998.